Indies - the word to some polish enthusiasts is similar to the tune Pied Piper played . It calls to us and soon we are following along and trying to capture that elusive polish. Pretty & Polished is one of those polish makers lacquer lovers clamor for. Pretty & Polished polishes will soon be available at Llarowe and is available on certain release dates at Etsy. Llarowe is a one-stop shop for specialty nail polishes that aren't readily available in stores. I have seven Pretty & Polished creations to share with you today. First up is Freedom Calling. I layered this over Picture Polish Tart. I didn't have to fish at all for the glitter. Multi-shaped glitter abounds in a clear base. Next up is Hello Dolly. Tons of multi-size and shape pink-toned glitters with white accent glitter in a clear base I put Hello Dolly on over UP Brilho Rose. 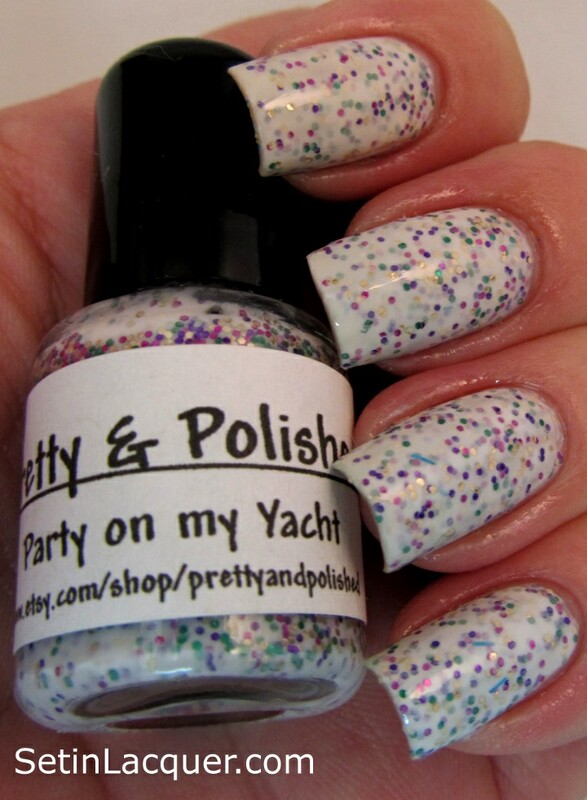 Party on my Yacht is a white based polish with tons of multi-colored glitter packed in the bottle. It applies with ease. Sand art has tons of matte particles - greens, blues and blacks abound in this polish. It actually applied fairly smooth. This is three coats. Punk'd Up Betty is one of those polishes that requires a little effort in application. Make sure you apply thin layers or it will be lumpy. Pink, blacks and silver are packed into this polish. Personal preference but this one isn't for me. It's one of those polishes that some go gaga for and some can leave behind. Pool Party actually makes me think of a pool. Multi-color and multi-shape glitter are swimming in aqua blue base. I had to fish around a little for the larger glitters but it wasn't too hard. Tart has a soft shimmery pink base. Multi-color and multi-shape glitter are plentiful. Bottom line: The Pretty & Polished polish line is a good indie line. The application was easy for glitter polishes and it dries quickly.